The search is over! 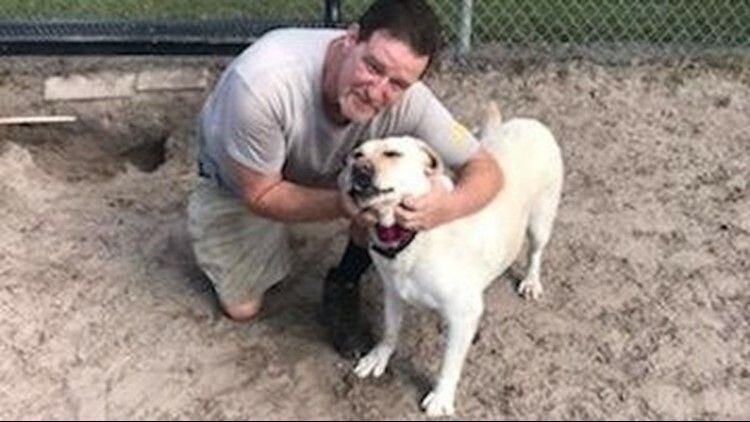 A Pasco County veteran and his lovable Labrador Sandy are reunited. LAND O LAKES, Fla. -- An air force veteran’s missing emotional support dog is back in the arms of her best friend. Sandy, an 8-year-old Labrador Retriever, was separated from her owner, Larry Peteet, after a car accident that was brought on by a heart condition. The crash sent Larry to the ICU for three days. He asked first responders to take his dog to his neighbor’s house while he was in the hospital. Larry got home from the hospital and was beyond excited to see his four-legged friend again. But when he got to his neighbor’s house to get Sandy, he was met with a frown from his neighbor instead. Larry said his neighbor would not tell him what was going on and just told him to head to the office, he said in a Facebook post. After going on what seemed like a wild goose chase to find Sandy, Larry said a friend of his told him another neighbor took Sandy when the first neighbor he left her with couldn't take care of her. After Larry hired a pet detective, a good Samaritan called to let them know they had Sandy. They said they were given Sandy after they were told she was abandoned. Sandy and Larry had an emotional reunion Monday. “I’ve been crying all morning,” Larry said. The two spent Tuesday morning at the dog park making up for lost time.